Just click on a photo to go to the original post for that card. I sometimes surprise myself by the different styles of cards that I do. They can be clean and simple, a little whimsical, or vintage(ish). I don't like to stay in one category. It's more fun to test my boundaries from time to time. Beautiful cards, Colleen! Like you, I cannot stay with one style as I like so many different looks. I love all your styles! I think we should let creativity take us where it may! You do it beautifully. Hard to pick a fav but I do like that green holly card. All are really pretty cards. Your work is very nice. It's so fun to see them all in one place! Beautiful card, Col and a wonderful year in review! I began following your blog sometime in the middle of your first year, and had not seen all of these earlier cards. So much gorgeousness! Of today's batch, I especially love the burgundy With Gratitude scalloped card. But it is not the only one I plan to CASE! I have other "favorites." TFS! So glad you decided to blog. another batch of super super cards! I love all your embossing, and I have to get me that holly embossing folder!!! Such fun celebrating your milestone by looking back! And looking back at all of those gorgeous creations just makes me look forward to what's next! Oh wow, I am soooo impressed with your variance in styles! These cards are so great! I really mean it! I love the Christmas ones but then the whale was just too cute! Then there is the sort of vintage one and on and on! Thanks for reviewing some of these cards that I had either missed or forgotten - how I could forget some of them, who knows! Looking forward to some blog candy! What a diverse group of cards! That blue ornament card is divine! Your posts looking back on your favorites are so fun! I love seeing favorites. A wonderful parade of fabulous designs. These are awesome, Colleen! Happy Blogiversary! Well......I don't know how you do it, and if I'm honest I'm quite jealous! How do you go from CAS to vintage?! I'm impressed! I am a CAS girl through and through but lately I've been attempting the shabby chic look-I just can't get it to look right!? Maybe you'll have to give me some pointers! these are so great, love the peaceful wishes card, forgot I was going to kopykat that one, lol. Happy Anniversary Colleen!!! I just love looking at all your cards and the variety! What a treat... enjoyed looking at all your past beauties! I love your styles, Colleen! You are sooo talented! Oh, Colleen! So many gorgeous creations! LOVE to see them all lined up like that! Oh my goodness! Such a lovely parade of cards, Colleen! I think you saved the best for last. I was saying, WOW! I wanted to reach out and grab that card...so gorgeous! 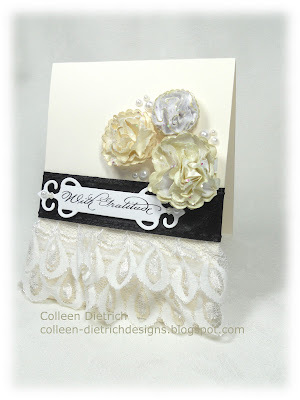 Those flowers and lace are just perfect for a beautiful elegant card!